Mireille, left alone and watched as a possible French spy in Germany, drew on a well of strength to live a quiet, determined life and survive the war. 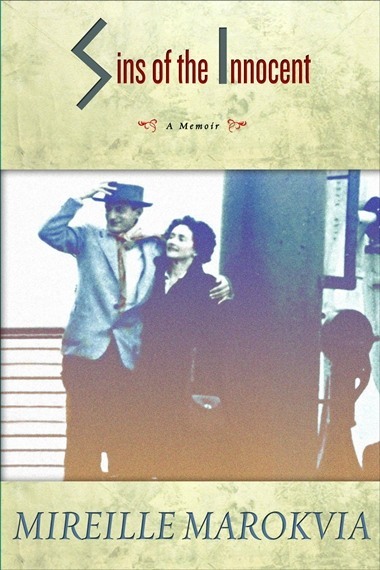 Passionate, straightforward, and enthralling, this new memoir offers a glimpse of the seldom-seen life of a French citizen in Germany during World War II…. Highly recommended. In her first memoir—Immortelles: Memoir of a Will-o’-the-Wisp—Mireille Marokvia described her life growing up in a small village near Chartres, France, in the first decades of the 20th Century. We learned in that beautiful book that the people in her life so long past still live like ghosts in her memory. This extraordinarily sensitive and assured writer brings that same dear voice and sharp vision to bear in her new book. But Sins of the Innocent covers the most difficult years of her life. From Paris in 1939, a young Mireille follows her artist husband, Abel, when he returns to Germany to care for his mother. Once Hitler begins his invasions across Europe the displaced couple must find a way to survive the war in a country they both consider foreign. Abel finally takes work, but it requires extensive travel through the war zones, and so Mireille is left essentially alone. With France lost to her, and horribly misfit in wartime Germany, suspected by her neighbors of spying for the Allies, Mireille has to define a life for herself, a life that is as quiet as possible in a dangerous world. Sins of the Innocent is a lyrical portrait of those harsh years, infused with doubt, anger, and the author’s love of life. These were the years in which Mireille learned the difference between quiet persistence and courage—during WWII in Europe, a time when so many had to find their own small places in history. It was the era that determined who Mireille Marokvia was—and who she still is. After some time I ventured to peek over the counter and stared into a handsome, tormented face, young yet lined, blue eyes smiling but veiled with melancholy. He spoke with a foreign accent, was whimsical, charming. I never remembered what he said. Like most French, I was fascinated and awed by the Russians, their literature, their history, their fate. I met them daily, the taxi drivers, bartenders, musicians, waiters and waitresses who had, in another life, been generals, grand dukes, grand duchesses, princes and princesses. Proud, romantic, sometimes arrogant, they were the White Russians, who could laugh and cry and sing all at once. I also knew the other Russians, the Red Russians. A friend—a model—had taken me to the studio of Lavroff, the sculptor. A man as quiet and powerful as a tree, a fervent communist, he had an unlikely obsession with Pavlova, the famous ballet dancer and idol of the White Russians. There were only sculptures of Pavlova in Lavroff’s studio, in bronze, marble, and plaster. Thin, shabby students came, drank tea and talked, and talked, and preached in bad French about the new faith that was conquering the world. Did they ignore the sculptures for the sake of a talk, a cup of tea, or a bowl of borscht? Shortly after Pavlova died in 1931, the White Russians sponsored a gala in her memory in the Paris opera house. For one night out of a dream, Russian generals wore their uniforms and their medals, princesses and grand duchesses their grand couturiers dresses, their tiaras and their diamonds. I watched from the upper galleries in the company of Lavroff’s model and some communist students. The sculptor’s bronze Pavlova stood in a place of honor in the lobby. Was Lavroff among the Red or among the White Russians that night? I never knew. What I knew was that the Russians were too enigmatic for me. So was the handsome Russian I had met in the spring of 1935. I avoided the Russian bar vicinity, the artist’s quarter. Twice, from far away, I saw him. Twice, I fled.